When he’s not running the amazing Jewish community group for Druzya DC: Jews of the FSU, hiking across Shenandoah, or working as an engineer, Maxim is…eating hamantaschen?! Get to know the founder of Druzya DC with our exclusive 1:1 interview! Allie: I hear you helped start the group Druzya DC, tell me a little bit about this group and what motivated you to start it? Maxim: Druzya DC was organized by two of my friends. We wanted to unite the Russian-Jewish community. I come from the NY/NJ area where the sense of the Russian-Jewish community is very strong. Growing up, if I wanted to find a Russian store, doctor, lawyer, or plumber – all I had to do was ask and the community would take care of the rest. When I came to DC, this sense of community for Russian Jews did not exist yet, and I wanted to create it. Two of my friends that founded Druzya DC with me eventually left to follow other life ambitions, but I continue to run it in my spare time. I love bringing people together. You can check out our Facebook page with events and details. Allie: In what ways do you think Russian Jews differ from American Jews? Maxim: If you know American Jews and Israeli Jews, Russian Jews would fit somewhere in the middle. American Jews grew up with the safety and freedom inherent in their country. Russian Jews grew up with anti-Semitism, government oppression, and The Gulag. Although many American Jews have not been tempered by these same experiences, they serve as great examples about how much you can achieve, while being Jewish. In politics and religion, I think many Russian and American Jews can be polar opposites. Many Russian Jews grew up after the monarchies fell and were replaced by a variety of socialist systems. They saw what these kinds of governments can do to people– and because of this – tend to lean right. They also differ on religion. Many American Jews believe in God and are religiously observant. In my experience, I notice that Russian Jews, who grew up in a country with no or little religion, are not as observant. Many see being Jewish as less of a religion and more of a culture with certain beliefs, spirituality, and traditions. Allie: What do you love about the Jewish community in DC? Maxim: Coming from a very large Jewish community in NY/NJ, it has been wonderful to be a part of a Jewish community in DC that is slightly smaller. This smaller size allows the people in it to integrate and become closer to one another. It’s nice to have a place where everyone knows each other, hangs out at events, and if they ever need something, I know someone who can help. Maxim: Nature is my thing. I love getting lost in Shenandoah National Park; it is my home away from home. Nothing beats heading out into the deep woods, roasting something on a fire, and letting the sound of forest and nature engulf you. Allie: What are you most excited about in 2018? Maxim: New opportunities, new friends and new adventures! Life continues to move along, and we should enjoy every moment of it. Maxim: I can eat Hamentashen all day! Allie: What is your best piece of life advice? Maxim: Never let life bring you down. Things happen, and you can’t control that. You should never spend your energy trying to control things. Instead, take the good with the bad and continue marching on. Sometimes, life events are like buses – if one comes that you don’t want or like, wait a little, and there will be another one in 15 minutes. Maxim: …fun and music don’t stop until the light of dawn. Get ready, DC – you’re going to start seeing a lot more of our newest team member, Allie! She’s just come on board as our Communications Director, and she’s SO excited about her new role. From her background in marketing with The Jewish Federation of Greater Washington, to her unparalleled passion for the DC Jewish community, Allie is the perfect addition to our Gather team. Learn more about her path to Gather (and her obsession with all things Halloween). Shaina: Tell us about yourself! Allie: My name is Allie of House Cossman, Friend of Bubbies Everywhere, Queen of Young Jewish Professional Events, Breaker of Fasts. My lifelong passion for Jewish culture, tradition, community, and spirituality have followed me from the faraway land of Potomac, Maryland, to Ann Arbor, Michigan (go blue! ), and now to our nation’s capital. When I’m not enthusiastically promoting or attending Jewish community events, I love hiking, whipping up new vegan recipes, unwinding in Bethany Beach, practicing my downward dog, and spending time with friends and family. I also proudly maintain a ferocious obsession with (the not so Jewish holiday of) Halloween, and anything spooky, mystical, or related to the best season in the world – fall. This autumn in particularly will be a wee bit extra special because my wedding “falls” in 53 days, but who’s counting? Shaina: What most excites you about working for GatherDC? Allie: Well, my very favorite things in the world are meeting awesome new people, being a part of our incredible Jewish community, and letting my creative brain soar. So, being able to meld these passions as the GatherDC Communications Director is one of the most extraordinary opportunities I’ve encountered in my life thus far. I can’t wait to get to know the phenomenal Jewish young adults across DC, and help each and every one find their niche and discover a deep sense of belonging. Moreover, I hold a profound admiration for all GatherDC has done – and continues to do – to strengthen our local Jewish community and cannot wait to be a part of this remarkable mission. Shaina: I heard you met your fiancee in a pretty cool way. Do you want to tell us about that? Allie: Many, many years ago (3 to be exact), on a Wednesday evening in our great District of Columbia, the sun was shining, the drinks were flowing, and the Jews – were Gathering. Gather the Jews (AKA GatherDC) was hosting its May happy hour on The Brixton rooftop. Allie thought (why yes, I am telling this story in the third person. I think it gives the drama a little boost), this would just be like any other happy hour – she’d schmooze, nosh, gather, and head on her merry way. That all changed the moment she spotted one Mr. Andrew, house of Friedman, Lord of the Avocadbros, across the bar. His blue eyes glistened in the sunshine, his dimples made her swoon, and the moment he said “hey, what’s up?” she knew….she knew that one day he would become her lifelong Bachelor in Paradise viewing buddy, and also her husband. So, it’s safe to say GatherDC holds a pretty special place in my heart (back to first person now) and my Jewish journey, and I can’t wait to share this “Gather” love with others. Shaina: What’s your favorite Jewish holiday or event? Allie: Shabbat! I mean, yes, Chanukah latkes are quite delicious and it’s always fun hanging out with Elijah come Passover, but let’s be real…you can’t beat a holiday that happens EVERY. SINGLE. WEEK. You just can’t! Plus, challah. No phones. It’s Friday – meaning the best excuse to jam out to Rebecca Black. Most of all, it is a sacred responsibility to set aside our stresses, worries, and anxieties; to power off our devices; to sit back, eat, sing, be present, and RELAX. I’m truly grateful to have this miraculous opportunity, every week, to be free from the frenzy of daily life and present with the beauty of life’s simpler things. Shaina: What is something not a lot of people know about you that you’d like to now share publicly with thousands of our readers? Allie: I am very much into practicing – and learning about – mindfulness. I love listening to Tara Brach podcasts, meditating, taking yoga classes, and doing what I can to live each day as presently, fully, and wholeheartedly as I can. It’s a tall order, but I may as well give it my best shot! Allie: they have lox of fun. Shaina: Not to be “too DC,” but what do you do? Hilary: I currently the Head of Development for Plum Relish; we are a women-owned and managed “corporate catering” concept currently in the DC area. Our concept is geared to make the catering process super seamless, knowing the orderer is dealing with a handful of other tasks. Shaina: What’s your favorite place to eat in DC? Hilary: The hardest question! My answer will probably change depending on the day or neighborhood I am in, however one of my every day “go-tos” is Glen’s Garden Market. It’s a block from my house, they already have great prepared food at a decent price. and I am way comfortable drinking a beer there alone. Shaina: What do you see as the intersection between Judaism and food? Hilary: For me, food is Judaism. All of my favorite memories surrounding my culture are all food related, eating hamantaschen at the Purim Carnival as a kid, trying chopped liver at the Passover Seder at my Grandma’s house– or more recently throwing my first break-fast and scouring DC for good bagels (for those who are reading this Heckman’s in Bethesda sells an awesome product). I love that every celebration involves gathering friends and family to eat foods that our people have eaten for centuries. Shaina: What’s your favorite Jewish food? Hilary: An over-sized everything bagel with way too much schmear and a mountain of lox. Shaina: Explain your ideal Sunday in DC. Hilary: Sleeping in (that’s until about 8:00 am for me) heading to the gym then coming back home to lounge for the day, finally ending the weekend with a dinner with friends. Hilary: multiple days worth of calories will be consumed…at least that my DC Jewish friends. You may not have met Rose in-person, but you have likely seen her art around the city. This Jewish Artist of the Week sits down with us to talk about the art scene in DC, where you can see her art and how she connects to her Judaism. How long have you lived in DC? I am a DC native! Born on Capitol Hill, and raised in NW, Chevy Chase DC to be exact. What are some ways in which you connect with your Judaism? My father was (and still is) my most significant connection to Judaism. He would cook Shabbat feasts every Friday growing up, and we would host a myriad of friends and family around our dining room table. Those experiences, along with attending Sunday School, services, and of course my Bat Mitzvah, have had an influential effect on how I live my life today. I love hosting small gatherings, having critical dialogues, questioning the status quo and brainstorming action are things I feel grounded in from my Jewish education and experience. I have engaged with the amazing work of Jews United for Justice on a few occasions and enjoy returning to synagogue for high holy day services at Sixth and I Historic Synagogue each year to reinforce my connection to Judaism and the role I can play as an active participant in the narrative. Tell me about your art! How would you define your style and what inspires your work? I love art with every fabric of my being! I always have. I would define myself as a painter but am recently exploring ceramics and sculpture. I love working with large scale and have about 7 murals displayed in the DC area. I am drawn to public art that can be appreciated by many people, day after day and year after year. Content wise – I enjoy people and the human figure. I strive to make art that carries a message. I never tire of a face and a story it can tell. Art for me is a form of expression that crosses language and cultural borders and a critical tool for social influence and change. What are some of your favorite projects that you have worked on? 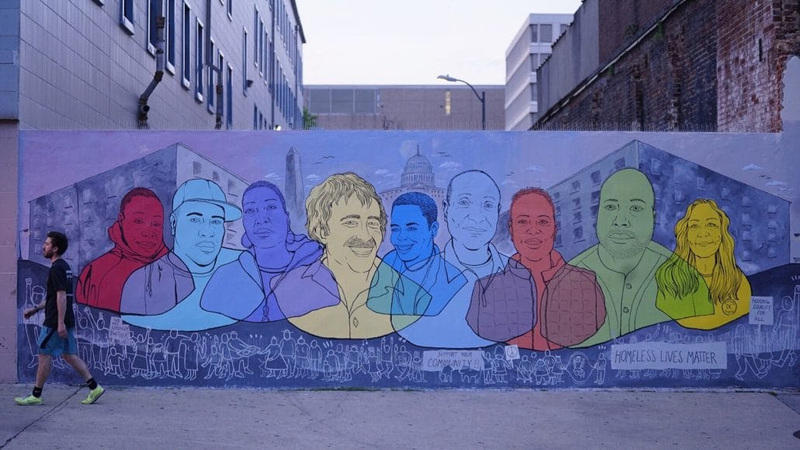 I painted a mural at the Mitch Snyder Homeless shelter last year as part of a MuralsDC grant. I photographed folks from the shelter and painted them on the wall. The entire experience was enlightening and solidified the importance of working directly with my DC community and using art to shed light on various populations. What’s it like being an artist in Washington, DC? What do you see as the advantages and disadvantages? I think being an artist in DC is both excellent and tough at the same time. There is money in this city, and the DC government treats its artists quite well compared to other cities across the country. The pool of artists is much smaller than NY or LA, so I am a bigger fish. The flip side is that the cost of living is so high that it can be unsustainable for artists to live (and make a living) inside District lines. When did you know you wanted to be an artist? How did you get started? I started drawing and painting around six years old and haven’t really stopped. That being said, I didn’t think of it as a viable career until college. Only then did I see examples of artists making a living from their work and knew that is what I wanted to do. I hustled after college with part time jobs, building my freelance portfolio and participating in gallery shows. After four years I made the leap to full-time artist. Do you have any work you want people to know about right now? The amount of green space, the diversity, the small size. What’s one thing you would change about DC? The transient population that does not invest time or money into the rich history and culture of this city. What’s the one thing you can’t get through the day without? I first met Kendra when she helped GatherDC with our Rebrand and launch party. From getting to work with her I saw her passion and dedication to her work. This week we dove into what inspired her to start her own business, what have been some of her favorite projects, and he love of food but why she isn’t a foodie! I work for a Jewish non-profit that helps ensure Jews marry Jews so we can make Jewish babies and then they can marry Jews and keep this whole thing going! Long Island. The Jewish part. Going on Jswipe, going to synagogue, going on Jswipe at synagogue, and brunching with my friends from Brandeis. What’s your favorite part about being Jewish? The Torah. I’m in a book club where we read the Torah each week. You really only need one book. So many life lessons! OK, so it’s like a sushi roll, except it’s called a Gefilte Roll. It’s gefilte fish wrapped in lox. And no rice, which is great because I’m actually carb-free right now. Yum! Are all of your friends Jewish? Define Jewish. No really, I’m so interested in hearing how you understand Judaism – it’s one of my favorite conversations. Wait, really? I would have thought Israel. When I’m in Israel I don’t feel like I’m traveling because it’s my homeland. Sabrina is a friendly face you will likely run into at Jewish events all over the city. You can find her at Shabbat dinner with Mesorah, a GatherDC Happy Hour, or at a Moishe House event! This week I got the opportunity to interview Sabrina about how she first got involved in the Jewish community, as well as her passion for music and the environment!